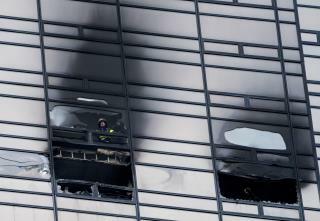 (Newser) – One big factor in a deadly fire at Trump Tower over the weekend in New York City is drawing a lot of attention: The 50th-floor apartment that burned had no sprinkler system, though that was perfectly legal. The city passed a law requiring sprinklers in high-rises in 1999, but only for new buildings, explains the AP. Because Trump Tower went up in 1983, it didn't need to comply. Trump was among the developers who opposed the 1999 law as too expensive, arguing that it would add $4 per square foot to an apartment. As the New York Post reported in 1999, he personally called council members to lobby against the measure. The opposition affected the final version of the legislation, allowing older buildings to be grandfathered in, per the Washington Post. it was reported last week that Hillary was on the 25 floor and dragging her case of vodka and a full box of giant matches! His rich Chinese friends told Donald: no fix, no fix, too expense, e weary ting all lite. And then the real fire suddenly happened. Now he’s going to pay big time. Well why would you want to put the fire out? That would be too convenient.